checking the box below for mGuard Secure Cloud public by the registered Client. software VPN client on the workstation side. Contact cellular modem   on the side of the machine or system. provided otherwise by the Client. Cloud for the connection of service workstations and machines. activated either permanently or only when needed. of the Client for the duration of the account activation. workstations and machines of the Client but only the Internet connection of the Cloud. and then made available via the Secure Cloud web page for the Client to download. states and keep them for a maximum of 18 months. (1) Any claims of the Client that exceed the aforementioned limits shall be excluded. loss of production, loss of profit or other indirect damages. Compensation for damages for breach of cardinal obligations shall be EXCLUDED. contractual partner may regularly rely on. 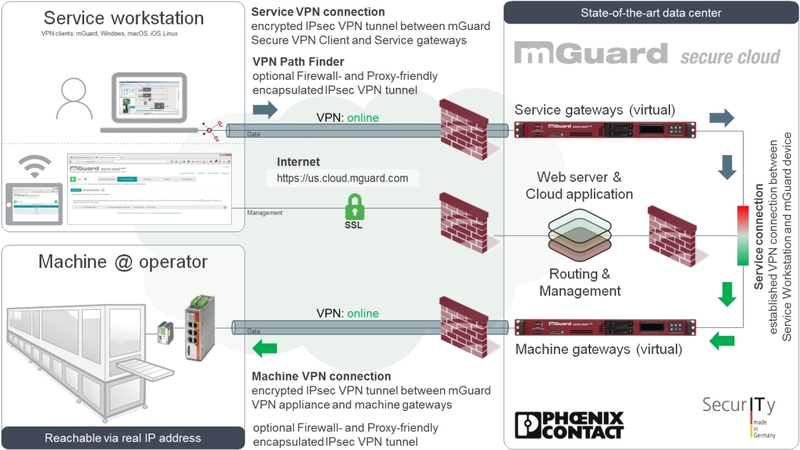 on mGuard devices or Software VPN Clients. parties (Internet providers) for its performance just as the Client is for its use. known to them in any other way, without the prior written consent of the other Party. years after the expiry of this Agreement. reasonable to it to ensure that the Confidential Information are treated as confidential. commits that it will not sell the Client’s contact information to any third party. registered Client and the first call-off order of a connection right to the Cloud. no longer apply upon its termination. (3) Place of performance shall be the registered office of Phoenix Contact. testing or approval procedures shall render any deadlines and delivery times invalid. The mGuard Secure Cloud service team will usually get back to you within 1 business day (8 AM - 5 PM Eastern time). Meanwhile, please restrain from duplicate registrations. If in doubt and without response for 2+ business days, please use the contact form of the mGuard Secure Cloud for status inquiries.